The first barrier educators and instructional designers find when they want to try a new technology is a lack of programming skills. In this post, I will present you a tool that is free 😀 yay!!!! It doesn’t required high levels of programming skills and it will let you create your own augmented reality application for mobile devices. The augmented reality development software we are exploring today is called “VEDILS”. Come and join me, you won’t regret it. 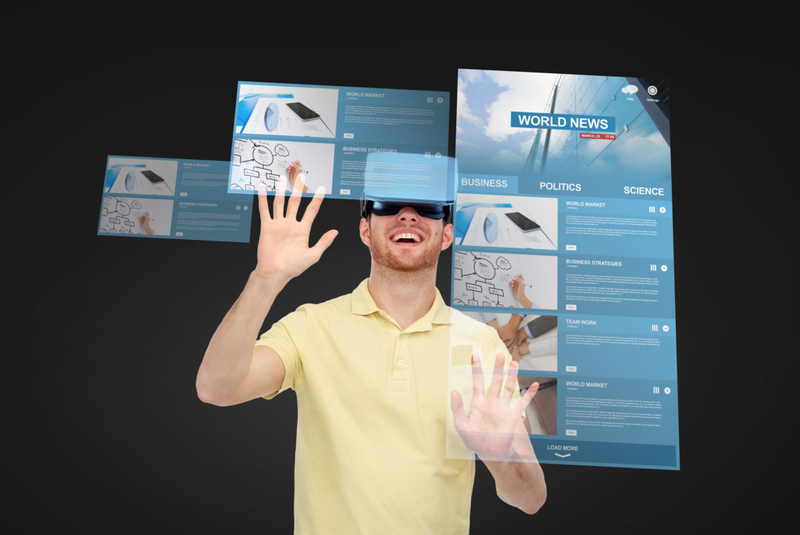 Augmented Reality is a technology used to “augment” the real-world with virtual 3D objects displayed in a screen (computer, tablet, smartphone). In the post, “Augmented Reality for Kids – Educational Magic to Enhance Imagination and Learning”, we explored the benefits of this technology for education, and more specifically, to engage students in fun and interactive learning processes. Here we will examine one platform that allows educators or anybody to create their own augmented reality mobile app. VEDILS means “Visual Environment for Designing Interactive Learning Scenarios”, and it was developed by the Department of Computer Engineering in the University of Cadiz in Spain. 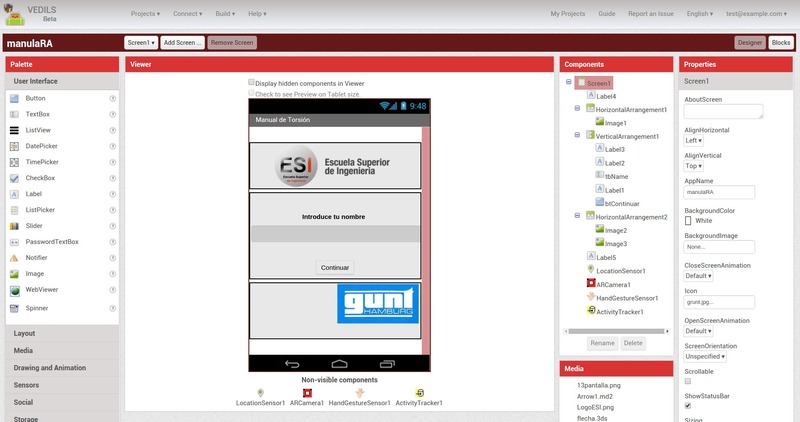 VEDILS is a visual tool to design interactive learning scenarios which can be deployed on Android mobile devices (tablets or smartphones). It can be also used for the development of Augmented Reality (AR) experiences, the tracking of user interaction data as well as the recognition of hand gestures and other features. With VEDILS you don’t need to install any software on your computer because it is a cloud-based platform. User Interface Design: You can design an entire mobile application and incorporate virtual objects to be deployed with AR. 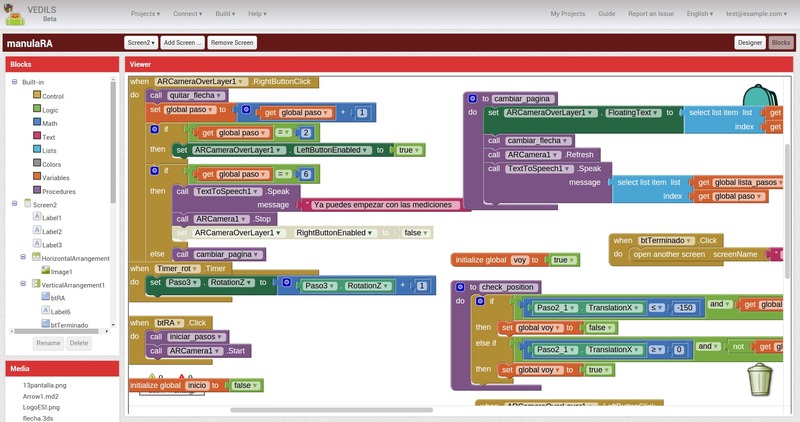 Design Behavior: By using a visual programming language, similar to Scratch, you can design interactions with virtual objects of AR. Testing: You can test from a device connected to Wi-Fi or a USB device. Information Retrieval: You can track user interactions and results of user actions for further analysis. To work with VEDILS, first you need to create an account with them by filling out a form. They will send you an email with your login credentials. As mentioned before, you only need a web browser, preferably Google Chrome, and login into their website. Section 1 – Designer: is where you design the app. Here you determine how the app will look in the mobile device. You simply drag the elements from the menu on the left and drag them in the mobile phone. You can include logos, buttons, text entry fields and similar elements to make your app work. Then for each element you will have menus on the right hand with the settings to configure them. Section 2 – Blocks: in this section you can define the logic behind the app. 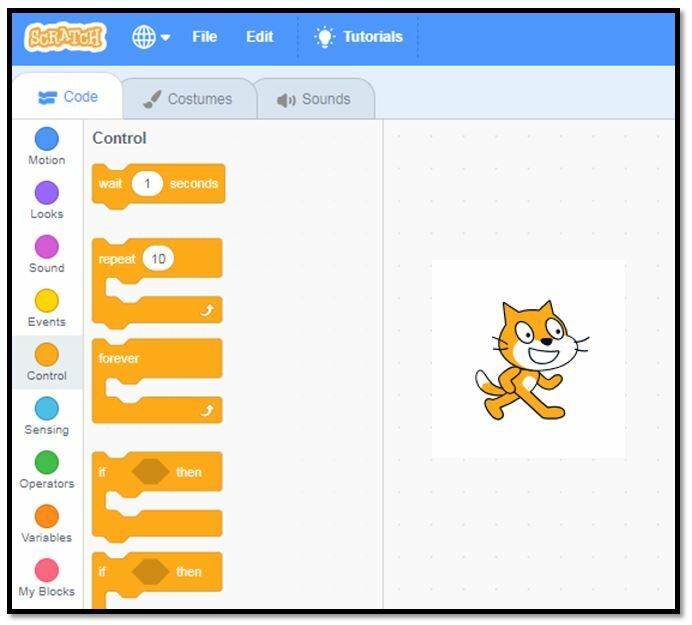 To do this, you will use a visual language that is similar to Scratch. Instead of writing code, you have blocks that define the syntax or logic of your program. Once you have developed your app and your logic, you will export your project by generating a file that is the one you will install in your Android device. This step is done under the “Build” tab. When your file is copied, from your device you click on that file to install the app. 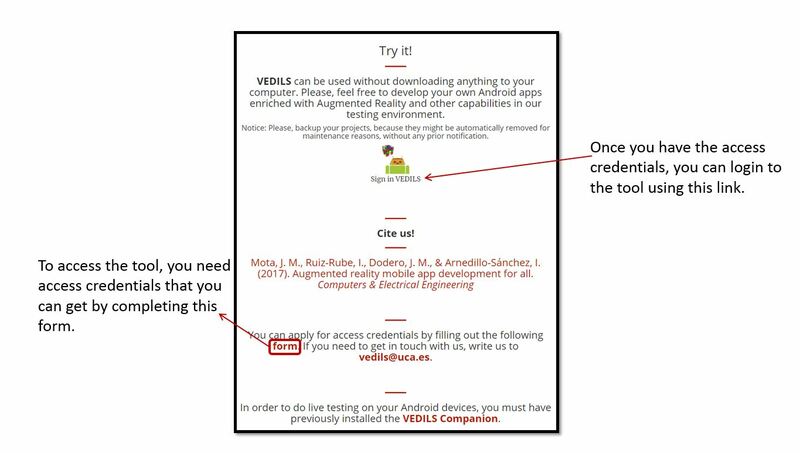 VEDILS is an authoring tool designed by Google under an open source license, and is currently maintained by the Massachusetts Institute of Technology (MIT). It is a block-based programming tool that allows users with different programming levels to start building fully functional applications for Android devices. The applications will use the technologies provided by Android devices such as sensors and multimedia elements. Some of these features are GPS receiver, gyroscope or accelerometer, photo camera, microphone, video player, drawing and animation, data sharing with social networks, and various web services. What can I do with VEDILS? To develop a manual for assembly equipment. The manual was available from a mobile app to provide students with the steps on how to assembly equipment. The app provided also the augmented 3D graphics to illustrate the process in a more realistic way. Imagine the uses of something like this for engineering and technical courses! Instead of explaining the content in a book, students can see the information in 3D and learn in a more realistic way compared to the 2D images in printed materials. To improve special vision capabilities in a course for graphic designers. Helping students learn German by playing an association game through AR markers. To provide an augmented reality experience in museum tours. The best thing of this platform is that it is free of charge. However, keep in mind that you are responsible for backing up you data because they might delete your project from their servers. Once you are sure of your project, you have tested, it works and it is installed in your mobile device you can just use it without any concerns. But if you want to modify it, then you will rely on them keeping your project in their platform. Otherwise, you will have to build everything again. I guess, it is done this way because it is a simple to use tool mainly for educational purposes. You can have your students developing their own AR mobile app and they will learn so much in the process. Not only they will learn a visual programming language and how to design and configure a mobile app, but also they will be able to create an AR solution that will have so many benefits for the users of the app. 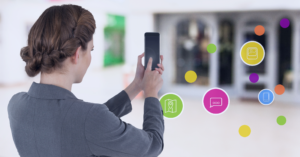 VEDILS provides an easy to use platform to create AR experiences that will wow your learners. You can also engage your students in the process of creating their own mobile apps, and how cool is that as a robust learning process of designing, planning, developing and implementing a technology as AR. The lessons of the course would be so valuable for your students and for you as an educator that promotes state-of-the-art technology in the classroom. VEDILS also provides workshops, tutorials, instructional videos and documentation to help you every step of the way while you embark in your project. I think we should keep exploring tools like this to engage our students and give them the opportunity to taste technologies they will find with more frequency in the academia and also in many areas of our lives. Next: Next post: Different Learning Styles – How to Design Learning to Accommodate our Learners? I usually had the mentality of writing plenty of Codes in programming languages like C++, c#, and PHP in developing mobile applications or systems in general! but VEDILS seems to be very much interactive, easy-to-learn and user-friendly due to its drag and drop feature! I had the plan of developing a mobile app but never knew how to kick off so you really made my day……Thank you. I’m glad I could help you with some ideas for your project 🙂 definitely try this platform. This is such a helpful article, thank you. VEDILS sounds amazing, but I did wonder if there are any issues with copyright when using it? Do you have full ownership of all intellectual material you build using the platform? Can other people (or Google itself) access your ideas and build upon them? Actually this is exactly the information that I was looking for about augmented reality development software and when I landed to your website and read this post, it answered all my questions in details. So I’m happy that you decided to write about this topic and share it with people. It’s very useful and can definitely be used as a great source and review for this software.